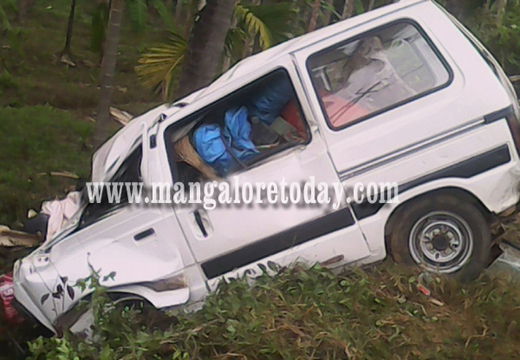 Puttur Jan 21, 2016: A man dies in an accident as the Omni car plunges down the road at around 4am in the morning. The incident took place at Parpunja near Puttur on Thursday, January 21. The deceased person is identified as Umar. He was 34 years and a resident of Santhosh Nagar in Madavu. Umar was on his way back from Puttur to his residence at Madavu. He felt drowsy and the car went out of control then plunged down the road side is said. As a result of the accident Umar sustained serious injuries on the head and died on the spot. A case has been registered and the Puttur police are investigating the case.